Boss Man’s note: Peter Petersen is SUPracer.com’s new South African correspondent. Peter is one of the country’s most experienced Stand Up Paddlers and is the founder of SUP Culture. 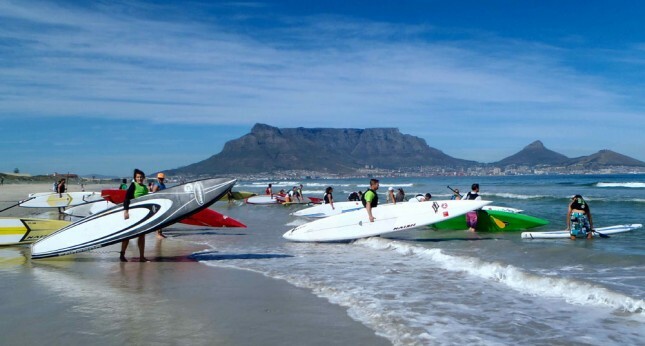 Cape Town delivered the most spectacular day for SUP racing on the weekend. 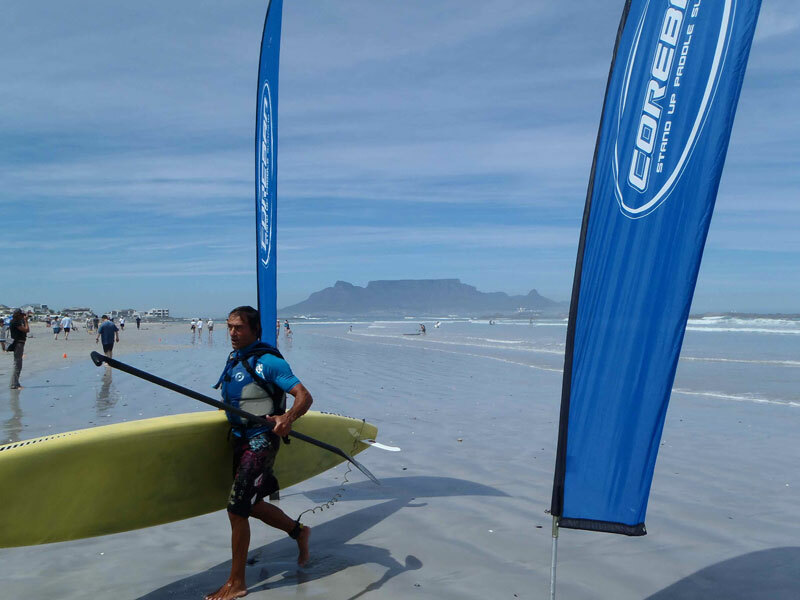 Conditions were perfect for the Coreban/Quickblade Battle of the Bay, with plenty of action from start to finish. The event included an Elite sanctioned race, which served as the 3rd of 5 races to select the South African SUP team that will travel to the February 2013 ISA SUP World Champs in Peru. Thirty paddlers set out from Milnerton in glassy, 3-4ft conditions. It was Dylan Frick and Durban challenger Scott Rutherford who blazed off the beach with Colin Heckroodt, Brad Adams, Pietro Muscas and Pete Petersen in tow. A little bit further back it was the Coreban team of Justin Bing and Tyran Cooper as well as Tom King staving of the masses. Brigette van Aswegen was having it all her own way in the women’s race, as the experience she gained in training for and competing at this years World Champs came to the fore. Meanwhile young Miska Steyn and Joshua Robertson showed they have the class and potential to challenge the Elite paddlers in years to come. The leading Elite paddlers, Dylan Frick and Scott Rutherford, swapped the lead back and forth several times during the race. 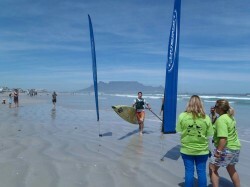 However it was Scotty who beached first at the halfway-point of Blouberg. He was just 100m ahead of Dylan as they headed back out for the second half of the Elite 20km race. 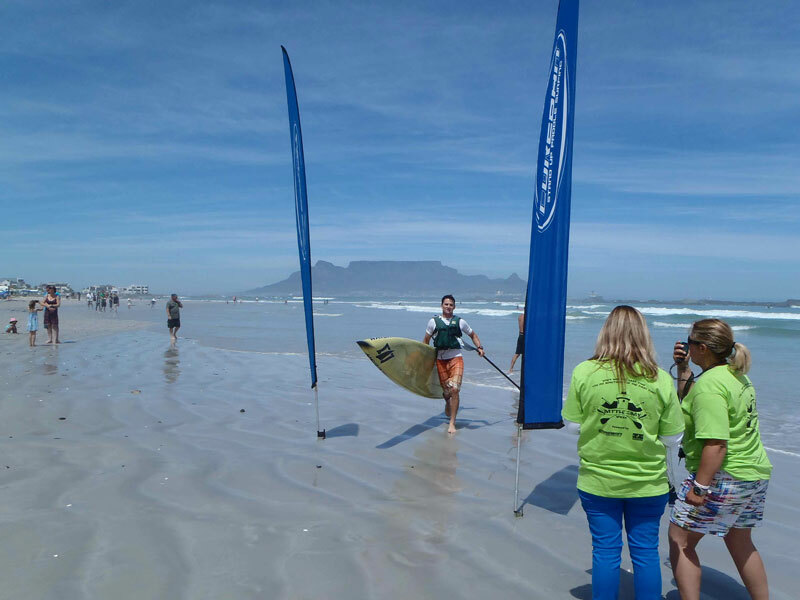 The two of them continued to trade places all the way to the Seli and back, but in the end it was the experience of the 2010 PE to EL surf-ski champion Scott Rutherford that had that little extra to give coming into the Bay, taking the victory 14 seconds ahead of Dylan. 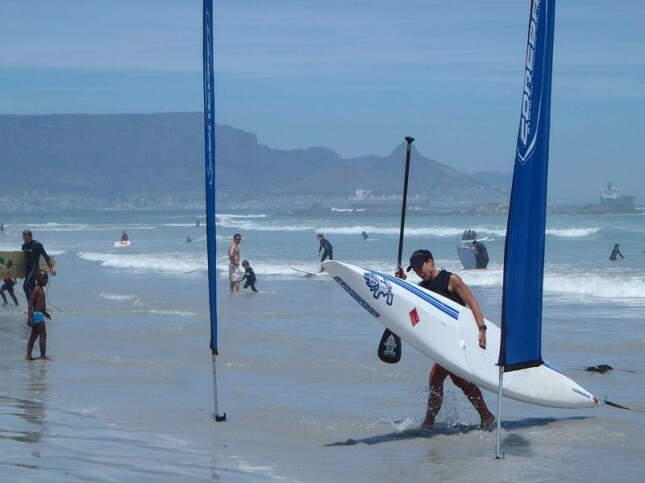 With the win, Scotty also makes a strong claim to one of the 2 spots in the South African SUP Racing Team. Colin, on a borrowed board, just didn’t have the stability to convert his power and had to be content with his 3rd spot. Both he and Brad Adams will have to really pull something out the bag in the final two races of the season to score a spot on Team SA. No other female could match Brigette, who will once again represent SA in Peru. In the Open Division, the Italian Stallion, Pietro Muscas on his new ‘hollow’ Naish showed why he has the real deal 6-pack and stole the show from Justin Bing and Tom King. 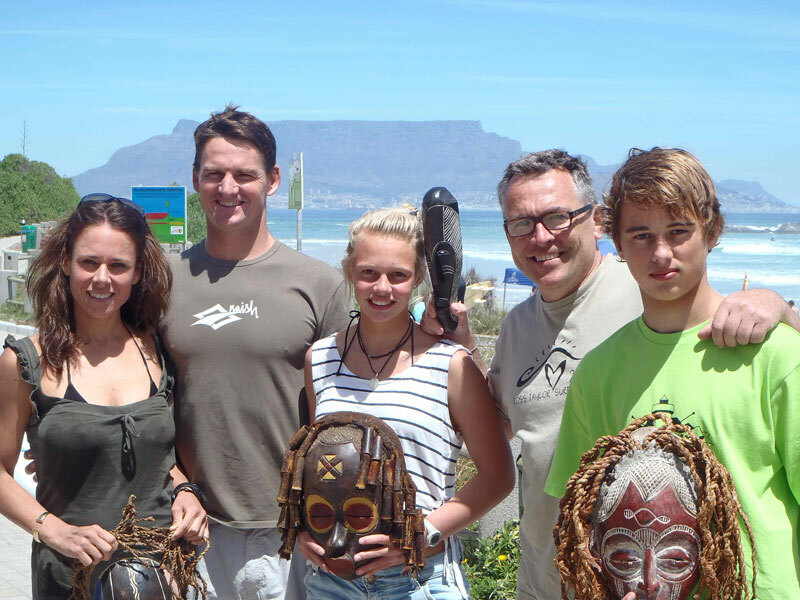 Miska and Josh claimed the juniors, while paddles up to Tarryn Kyte for enduring her longest paddle ever.